If you’ve gotten involved in motion picture or television editing during the last fifteen years or so, there’s a good chance that your world has been entirely digital from the get-go. If you’re a bit older, you can recall the days before electronic tools came onto the scene, and might even feel younger editors are missing something if they didn’t experience that more tactile, hands-on approach. Thus, your knowledge and experience with the tools and techniques from previous generations of editors may vary, perhaps affecting how you feel about the art of editing itself. Personally, I’m mostly a product of the digital age. 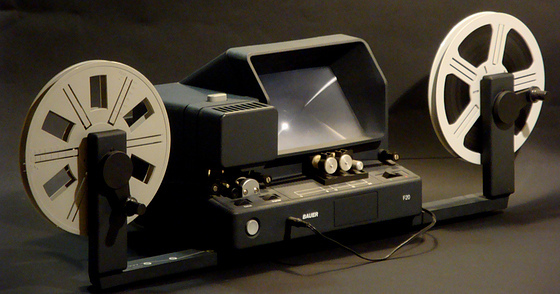 However, when I was a teenager I cut the Super 8 films I made with my friends on a small Super 8 editor such as the one seen below. While it might not have been a piece of pro gear, it definitely did its job while also giving me a whole lot of fun. I can recall many hours stooped over the device with my trusty little tape splicer at my side. Even these modest efforts qualifies me as having done both analog and digital editing. For the 75th Anniversary of the Motion Picture Editor’s Guild, I was asked to write a brief and concise history of editing technology for CineMontage, their official publication. Starting with the very first moving pictures, we cover scissors and glue, the birth of the Moviola, the rise of flatbed systems like Steenbecks and KEMs, and into the digital era. If you’re a seasoned pro, you might enjoy this trip through memory lane. If you’ve come of age during the digital era, here’s a chance to expand the knowledge of your art. Join me for a look back at the fascinating history of editing in A Brief History of Editing Technology available on MPEG’s website. Enjoy!